The name 'Blue Room' for Leinster Rugby's reservation-only lounge on the RDS grounds is quite ironic for a match taking place shortly after sundown in early January. While the temperatures weren't quite reaching the 'bomb cyclone' levels we've been hearing about lately from across the water, the ability to have pre- and post-match pints within walking distance of your match seats in a warm, non-crowded space definitely has its appeal, and I'm glad I chose this particular match to avail of the option. Eventually however, as kickoff neared, we had to leave our heated haven and make the move to the Grandstand, though we were grateful to have a few extra blasts of warmth from the pre-kickoff pyrotechnics which were situated in front us as the teams took to the field. I have to admit I had no idea how one-sided this contest was going to be; in fact I have my match preview as evidence...though even there I had us finishing on top if 'only' by about seven points. As it turned out we had a pretty good sense of how this match was going to pan out from the opening exchanges. Ulster received the kickoff and made a few attempts in vain to break out of their own 22 before their scrum half, the young Jonny Stewart making his first start for the province, cleared with a box kick that lacked both distance and accuracy and fell on halfway into the arms of Jordan Larmour. Perhaps the errant kick wasn't punished by our full back in quite the same manner as in Thomond on St Stephen's Day, but it still wasn't too long afterwards that he was touching the ball down over the Ulster line anyway. On our first attacking lineout situation after just 5 minutes, we nailed the dart, set up the maul, there were strong carries from Tracy and McFadden, and eventually it was Larmour skipping around a would-be tackler to dot down at the very same end which Connacht threatened before for so long before full time yet couldn't breach five days earlier. Shortly following the restart, Christian Lealiifano is 'welcomed' to Ballsbridge by a pile driver of a tackle from Jack Conan, who actually is a bit more rattled by the challenge yet it also proves to be a sign of what is to come for Ulster with the ball. 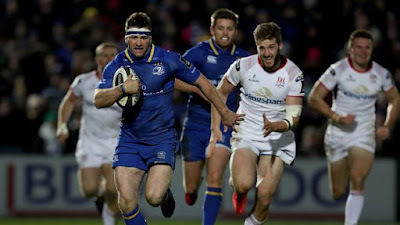 Then Leinster force their way back towards their line yet again - Fergus McFadden would be in only for a slip, yet to his credit he manages to keep the ball alive so that on the 8th phase of the series Larmour's quick hands put Barry Daly through for the score although once again the visitors will be disappointed with their tackling. Just like that we were 12-0 up and the first quarter was over in no time. For the remainder of that first half, the visitors did enjoy something of a purple patch, though I doubt they would want to call it that. Being able to finish tries well was only half of Leinster's ability throughout this Christmas spell. Time and time again Les Kiss' men tried to create try-scoring opportunities yet time and time again they were thwarted by our defence...if it wasn't our line speed forcing a knockon, it was our sheer physicality at the breakdown wresting the ball free. In fact apart from the one try they did get after the result was beyond doubt, their biggest chance of the match had to actually be handed to them...perhaps Ross Byrne was feeling a little too comfortable in looking for try number three when he forced a pass out to McFadden and it was well read by Jacob Stockdale yet he couldn't hold on to an interception which would have been a guaranteed seven points. Cian Healy, Richardt Strauss, Michael Bent, Ross Molony, James Ryan, Dan Leavy, Josh van der Flier, Sean O'Brien. ...and that's leaving out no less names than Jamie Heaslip, Rhys Ruddock and Dave Kearney. Few would argue that's a selection that would be competitive at pretty much any level. Just knowing we could do without those players should have been enough to make me feel confident but when you factor in that Ulster by contrast were working behind the scenes to get in a replacement for Lealiifano, on top of their need to protect the likes of Cooney for the crucial clash with La Rochelle next weekend, you realise it was more common sense than hubris that had me expecting us to crack on and take all five match points. It took us just three minutes of the second half to cross the Ulster line again...Larmour again involved as he kicked one forward where it bounced perfectly for Gibson-Park to grab and flip back to his full-back to go over...only for the score to be called back as the Kiwi was a little too eager in his chase. ...just to take a break from the general writeup for a paragraph or two so I can harp some more on Fardy. On my bus journey home I noticed his feature in the matchday programme so I snapped a photo of a quote of his and shared it on the Facebook page. The reaction was pretty much what I expected. The contributions of a player like him cannot be measured in mere stats because not only must you factor his own ability and performance but also the positive effect it must have on those around him. ...soon afterwards Sean Cronin runs a sweet line inside to charge into their 22 before it gets to Scott Fardy who without even skipping a stride is able to fix his opponent before shipping it to Fergus McFadden who makes it to the line, once more at the expense of a tackle that perhaps should have been made. ...sorry but I'm going to break away from the main body of the article once more to go on about another Leinster player. You wouldn't normally associate 'unseen work' with someone wearing 12 on their back but in the case of Henshaw he seems to be making it the new norm. For me the biggest of many glaring contrasts between these two teams was their relative abilities in snuffing out the attack points of the opposition, and Robbie was more often than not at the heart of ours. ...Darren Cave carried it deep into our 22 only to have it plucked from his grasp nonchalantly by Robbie Henshaw and even from this deep we were backing ourselves to score, with good reason. A few passes saw the ball arrive in the arms of Andrew Porter, who had come on for Tadhg Furlong. The Lion tight head has made rampaging runs something of a trademark, though his young replacement showed a similar side to his own game, putting down both Cave and Stockdale before shipping it to Gibson-Park who had McFadden in support and the winger was able to coast home from inside the Ulster half, passing our seats in the process with a cheeky wag of the finger and full length dive to finish. Only 53 minutes had elapsed, but this match was over. Done. Dusted. I can only begin to imagine what it must have been like watching as an Ulster fan, especially since only now were they bringing on the likes of John Cooney and Tommy Bowe. Meanwhile I was being surprised by the introduction of Johnny Sexton - I'm assuming they felt he needed some game time but I hoped it wouldn't be enough to risk him getting injured what with all the Champions Cup and Six Nations rugby around the corner. Well it wasn't all that long before he was involved in try number five, with a perfectly disguised pass missing Cronin and finding Henshaw who's own quick hands got the man of the match Larmour in for his second. And as if Ulster's day couldn't possibly get worse, even the act of breaking their duck came at a price. A hard run into our 22 from Tommy Bowe eventually led to Stockdale touching down but the 2009 Grand Slam hero could play no further part after his contribution and the prognosis does not look good at the time of writing. The Ballsbridge evening was only getting chillier and the lure of the Blue Room was only getting stronger as the match wore on, but while the usual brigade started leaving their seats from even before the clock hit seventy, we hung tough to the bitterly cold end, and what's more, we were duly rewarded. I have to give Ulster some credit, however....they could have been tempted to cut their losses and put the ball out of play when the clock went red but they were playing into the North Stand where a sizeable portion of their awesome travelling support was congregated so they did their level best to knuckle down and work through the phases to give themselces one last score to remember on the journey home, yet once again there was anything but a reward waiting for them. Of all people it was Jordi Murphy, himself Belfast bound next season, who scooped up a loose ball and then just like that our bench sprang to life and sniffed a sixth try...Noel Reid took it towrads halfway before improvising an incredible pass to Max Deegan who, as if challenged to do better, did so with a couple of strong fends and a sweet offload into the welcome arms of Sexton who only had to canter over the line. And so came to the end of eighty minutes of what I can only describe as 'comfortable' rugby from Leinster. Sure, there was a lot of great work done, loads of impressive displays from several individuals as well as the team as a whole, yet all leaving you with the feeling that we were still playing within ourselves somehow. So as we returned to the comfort of Blue Room at full time to share our opinions, there was plenty to celebrate. Three wins from three interpros in eleven days with much chopping and changing of personnel? Outstanding. New players like Larmour and Porter to factor into upcoming Six Nations and World Cup debates? Amazing.